New York is said the be one of the most photographed destinations in the world but one man has managed to take a picture of the city like you've never seen before. 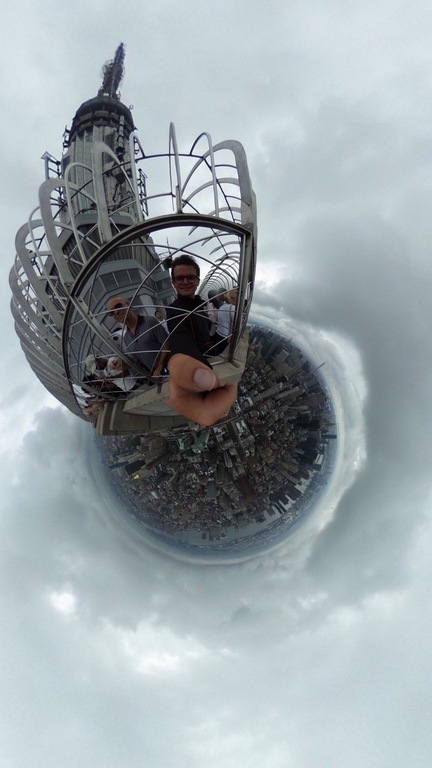 Thanks to a 360-degree camera, the British tourist, currently living in Vancouver, took a vertigo-inducing shot from the top of the 381metre tall building. In the image, the young man smiles at the lens with his hand poked through the railings holding the camera. Thanks to the rainy weather, there are also several clouds surrounding the top of the tower, which adds to the surreal effect of the picture, that was posted on Reddit by BritInBC. 360-degree cameras create completely panoramic images, using either one or multiple lenses. The picture can be taken with just one snap, instead of the traditional method of moving slowly along a straight horizon line to capture the footage.